Duarrigle Castle was erected in 1806 by Thomas Justice, and incorporates remains of a towerhouse built by the O’Keeffes in the sixteenth century. Its remains stand by the edge of a steep cliff over the river Blackwater and are approached from the north west thruogh an imposing castellated entrance, guarded by a large gate lodge. Duarrigle castle consists of a two bay two storey block, and a three bay three storey block, linked by a tall round castellated turrett. The doorway is in the forst bay of the three storey block and lit by a fanlight in the shape of an ogee arch. A set of limestone steps with curved wrought iron railings leads to the entrance. The mullioned double windows with hood mouldings also have ogee heads and finely moulded limestone surrounds. A plaque in the east wall reads: “Thomas Holmes Justice Castelum Duaragil reparavit AD 1806”. Near the castle is a high wall with a castellated arch. Another curved, wall contains a cellar type room with a vaulted ceiling. In older days is was one of the castles of the O’Keeffes, who also owned Dromagh and Dromsicane nearby, and they appear to have built it in the sixteenth century. In 1576 it was owned by Art O’Keeffe, chief of the clan, who was succeeded by Art Oge (died 1610): Manus (died 1636) and then Daniel. The latter lost the lands in 1654: recovered them on the Restoration, but unfortunately died before he could take them over. The lands were finally confiscated after 1692, and eventually disposed of by the Hollow Sword Blade Company. Abraham Dickson was the purchaser and in 1712 he left it to his grand-nephew Hugh Dickson (Bishop of Cloyne). By 1728 they were owned by Henry Bishop of Cloyne who made them over to James Maule. After that they passed to Henry Wrixon who gave a lease to Thomas Justice. 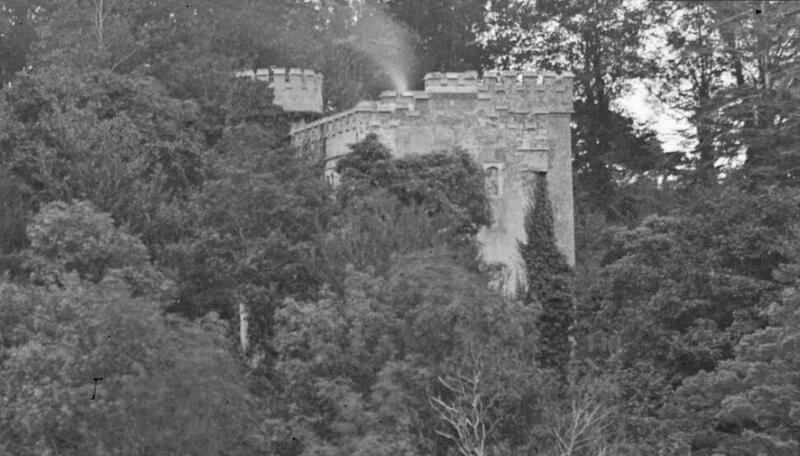 The castle and lands passed to Henry Chimmery Justice of Gurrane House, Derrinagree, who lived in and worked as a barrister in Dublin, and who died there in 1859. He left the castle to his sister Ellen ( Mrs Wallis) and she in time passed it on to her daughters, Mrs Moriarty and Mrs Crofts. 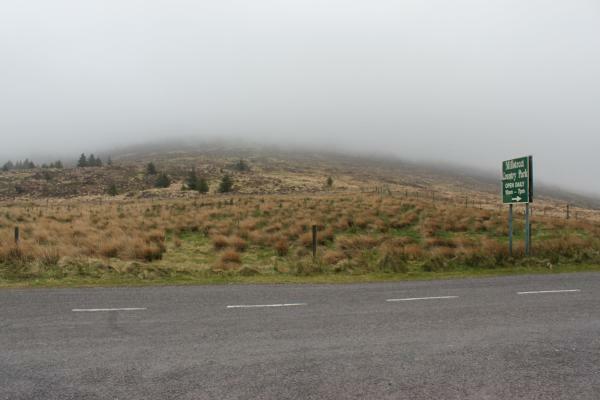 Eventually it passed to the Land Commission, who sold it to a daughter of the O’Callaghans of Kanturk. She had married a Greek and rejoiced in the name of Madame Halikiopolo. She died about 1950 but not before she had got a happy reputation for noteworthy tea parties. No other use could be found for the house so it was sold in 1955 to the Houlihans, who dismantled the castle roof and moved into the gate lodge. I am a direct descendant of the Justices who owned the mock castle. My great Granddad was Robert Nicholas Justice who either owned it or lived there, and his Dad was Thomas (possibly Thomas Chinnery) Justice who did own it at some point. I am a descendant of Dr John Moriarty who married Ellen Wallis – whose mother (Ellen Wallis – nee Justice) was left the castle in 1859 when her brother Henry Chinnery Justice died. My father Thomas John O’Shea a carpenter by trade used to talk about Duarrigle castle and the fine paintings, but as a child I did not really listen or ask questions. about Grace Justice who married the carpenter named O’Shea and their daughter Annie and whether they had any more children. I’m looking at my family history information and have found a Grace Justice who married Thomas O’Shea. That can’t be your father though as he was born about 1812 (I don’t know the exact date). I also have their daughter, Annie, and have this note about her: “She was claiming the Castle and surroundings near the end of the 1800’s”. The problem with having so many notes about so many people is that sometimes you don’t know where that information comes from! I often make a note of that too, but haven’t in the case of Annie O’Shea. Grace and Thomas had 2 other daughters (Ellen and Elizabeth), and a Son (John). I also have Grace’s father, a Henry Chinnery Justice. Justice is where it connects to me, as that was my Grandmother’s maiden name. I seem to have lots of other names too but not too much information. I also don’t have a direct link to my own family, but I know there must be one. 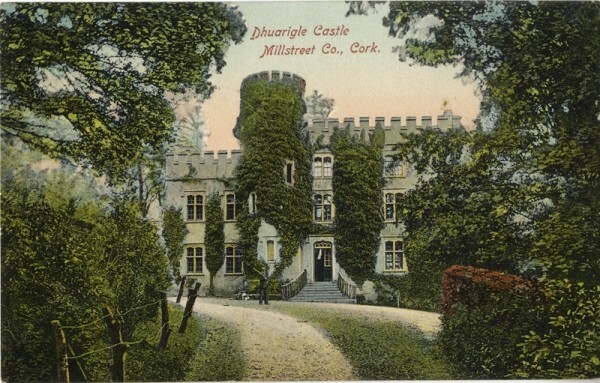 I am aware that the O’Shea family owned several buildings/castles in the area, and I once wrote to someone who was a decedent of them and they visited Duarrigle Castle and sent me some photos. I don’t think I’ve been very helpful but if you’d like to ask anything more, or give me some information about anyone in the Justice family, I’d love to hear from you again. Thank you Geoff for your reply, I will be in touch. I have been reading the “Recent Comments” with interest. Thomas O’Shea married Grace Justice, as you stated they had three daughters Annie, Ellen and Elizabeth with one son John… Their Grandfather being Henry Chinnery Justice. you also mentioned that you were in touch with a descendent and they visited Duarrigle, would that have been an O’Shea? I am very interested in the O’Connor side – have you any information? Thanks for the info Elaine. I’m getting so mixed up with who’s who that I need to think about it more and study all the information here. I’ve already swapped names around in my database as I seem to have got them in the wrong place, but I’m still mixed up. Once I’ve sorted that out I’ll go back to your post and try to fit all those names in with my database. Yea it was an O’Shea I was in touch with before, but I’m afraid I cannot find a record of their first name and can’t remember, as it was several years ago. I could probably find some records somewhere, if you want to know more about who they were. I cannot find anyone in my database with the name O’Connor so I can’t help with that unfortunately. Hi Ceri. Would you tell us whereabouts in the Justice family tree you come please? Maybe your grandparents or great grandparents who had the name, and who they were married to? It might help me and others place you in the tree somewhere, or at least the line that is directly connected to you. Thomas O’Shea married Grace Justice and they had 3 daughters and a son. I was told by an aunt some years ago that the O’Shea’s were related to the O’Connors or O’Conners. I’ve tried to find your relatives on my family tree, but no luck yet. I’m sure we must be related somehow though if we both have ancestors connected to the castle. I do have lots of gaps in my tree, which I’ve never been able to fill. My Great Grandad was Robert Nicholas Justice, who lived in the castle at some point, and my Grandmother (his Daughter) lived there too. Robert married Maggie Foreman, but had moved to England at that point (to Greenwich). Robert’s Father was Thomas Chinnery Justice, born in Co. Cork in 1841. He married Mary Gibson. I have lots of other names too. Do any of those mean anything to you or anyone else? hi Geoff, Thomas Chinnery Justice does mean something, although I think I have seen it spelt “Chenery” too ? Ceri – I have also seen it spelt that way. I’ve seen someone else in the family with that name too but I can’t link them to me yet. i’m a justice aswell & have recently been having a browse into my surname & i am surprised to be reading things like this. not sure if i’m the same family as this but my surname is from my dads side (paul) but we all born in england but family is from cork somewhere. i know extremely little. my grandads name was henry justice with his brothers being conrad & tighe. i know my grandad had a 1st wife (my gran) but i dont know her name or ever meet her. i think she went back to ireland from birmingham but thats all i know. Hi Ray. When I read that name “Tighe” I thought we must be related, as I knew someone in my family was called that and it’s a name I’ve never heard before. However, after going through my family tree, I cannot see a connection. The Tighe I know of didn’t have any brothers called Henry or Conrad. I bet there is a connection somewhere but it’s so hard finding enough details out to link people. Hello ceri. shows how much i know, he was always ‘uncle con’ to me so just assumed conrad & have done since i was little & also never heard my grandad called hinky before haha. my dad has mentioned names of people hes in touch with but tbh it’s all new to me. something i want to find out more about when i can…. Hello again Ceri and Ray. Well reading both your further comments, I’m sure we are all related. The Tighe I have in my family had a brother called Hinky, but I didn’t know that was a nickname. I know of Cornelius but don’t have him listed as another brother. I think I have him listed in another lot of Justices that I’m not able to connect to my own family, but this could be where they fit together. I also have other siblings to Tighe and Hinky – Brian, Maureen, Betty (probably Elizabeth), Michael and Patsy. Do either of you know of those other siblings? It could be that some of my information is wrong. There is too much similar here though to not have a link. Ceri – Do you have a family tree on file that I could look through please? Forget my last message, as I’ve found more information now. In another branch of my family I see another Tighe, with siblings Cornelius, Thomas and Charles. Hinky isn’t there so maybe I have him in the wrong place in my tree. Ceri – You said before that your Grandparents were John and Jane. I have a note for the Husband of John (I think it must be the same John!) that his wife was Joan, which is something my Grandmother told me before she died. She was absolutely certain about that, but she was certain about other family connections that turned out to be wrong too. So I’m sure Jane is what it should be, and that makes John my Great Granduncle. My note also says that John and Jane were God Parents to my grandmother (Mary Kathleen). I have been told that Jane was Hanna, but that was by someone who knew a lot of information and a lot of it turned out to be wrong, and he never said who he actually was. Ray – You are possibly then the same relation to me? It’s getting very confusing and I’d love to see the family tree from both of you, as you’ll both know for certain the names of your direct family and that’ll help me edit my tree to be more accurate. I have information for other people that I know are in my tree but I just cannot fit them in. tbh what i know is very limited. as far as i know my grandad (henry) had 2 brothers tighe & con. i remember uncle tighe being a big man in height & weight because i can remember him chucking a shot-put ball about like it was a tennis ball. i think uncle con was tall but not sure on weight (this is all from memory of 20+ years ago thou). not sure on what children either had apart from ceri. my dad has a half brother (same dad) called david. i have a brother called jamie-lee. i remember going to see relatives (justices) somewhere near liverpool when i was a bairn but dont know who till i speak to my dad & that is my knowledge of the justice family, i have no tree to speak of, just a few dangly branches. i moved away from where my dad & grandad are when i was small so never get to have the chit chats about family (apart when we’ve had a few jars, then some stories come out but normally too drunk by then to remember properly :()…. sorry i cant really help you geoff. i need to find out more on this. Just to fill in some gaps for you. I am Maureen Justice, widow of Thomas Justice who was brother of your grandfather Henry Justice(always called Hinkie by the family. I remember you visiting us with your little brother and your sister Laura( who I know died very young in a tragic accident). I live in Southport, Merseyside about 17 miles from Liverpool so your memory is correct! You probably know all this now but if interested in family history it might be helpful to see it written down. Your grandfather was one of 5 brothers born to John and Jane Justice who married in Co Cork in 1928. Jane’s name was actually Hannah I believe which also equates to Joanne, hence the confusion with names. The eldest brother was my late husband Tom followed 13 months later by Con ( Cornelius) father of Sean and Ceri. Con died in Ireland about 2002. The next brother is Charlie who lives in California. I speak to Charlie every couple of months. He has 6 children -5 boys and a girl Sharon. I have met 3 of the sons John, Michael and Kevin. Hinkie your grandfather is next followed by Tadgh ( Timothy) who I am sure you know died a few years ago. My two daughters are Lisa and Siobhan. Firstly, to Ray. Thanks for your reply Ray. Ok no problem that you can’t tell me much. I think once I have got you placed in my tree in the right place, I’ll go back to these letters and look at the other names you gave me. Ceri – It sounds like my Gran exaggerated your Dad’s height. 🙂 I keep switching between your details and my family tree, and I’m so confused (doesn’t take much!). The more I study it, the more confused I’m getting. I need some more time to study it all, and then I’ll get back to you on here and probably ask lots of questions. I’ll answer your questions first. My Parents and me live in West Sussex, near Littlehampton. They are Glenis and Trevor Smith. My Mother’s Mother was Mary Kathleen Cook, maiden name Justice, and according to my notes she was your Grandparent’s God Daughter. Her Father was Robert Nicholas Justice, who was your Grandfather’s Brother. Thanks for your reply Geoff. Ceri said that she was connected to the O’Connors (Jane O’Connor). I think I know a little about the O’Connor’s, but just wanted what I think I know confirmed! If you can trace the O’Shea you were in touch with that would be great…all very interesting! Yes I read that about the O’Connor’s from Ceri just after replying to you before. I’m afraid that’s the only information I have about them – So not a lot! Sorry I can’t help more. I have found who I wrote to about the O’Shea’s….but also found that it was the Keefe’s! Whoops. I’ve been confusing O’Shea’s with Keefe’s – Well they are spelt so similar! *giggles* I’m sure they are also known as O’Keefe, and they owned several buildings in the area. It was Brendan Keefe and his wife that went to Duarigle Castle and took some photos for me several years ago. I’ve been going back through emails I have back to 2001 when I started my research. Many of my contacts stopped writing, and I fell out with one (I have no idea why now) called Nicky, who was related. I’ve found several people over the years who seem to be related, but after information is swapped I end up knowing very little more about my own family and don’t manage to connect myself and them. Thanks Geoff for your reply. I did write to an O’Connor some years ago and I received a lovely letter back…he spoke about the beautiful paintings, and I believe he spent part of his childhood at the castle…I have a photograph (image) of him and he is identical in looks to my late uncle. I think it would be good if all of us with connections to the family wrote elsewhere, so our posts didn’t get moderated every time, and we were more free to share personal information, and the sum we have to do to send our posts didn’t keep saying we’ve done it wrong when we haven’t! I’m just not sure of the best way to do that at the moment to ensure others can also read it. I have webspace of my own that maybe I could set up with a mini forum? Or we could just swap email addresses maybe. Any thoughts? I need more information to carry on my research on this line anyway, so I’ll wait for a reply from others and take it from there. If anyone wants to give their contact details, please do. Ceri – I think I’ve sorted my database out, and what I’ll do sometime is put it on the web so anyone can view it. I’ll post a link here when I’ve done that. I have some questions please if that’s ok. Did your Dad, Cornelius, also have Brothers called Tom and Charles, as well as Tighe and Henry? I have been told (probably by my late Gran) that Charles was 6’5″ and 15 stone, and emigrated to New York either during or after WW2, and became a NY cop. Years ago I investigated that and the NYPD didn’t have his name on record. So it’s all a big mystery. Do you know anything about that? You already confirmed for me that Brian and Patsy were cousins of your Dad. Are you aware of other siblings Brian and Patsy had? My records have Maureen, Betty and Michael. Do you know if they are correct or not please? Ray – Your Dad is my Mother’s 2nd cousin too, which makes you her 2nd cousin once removed. Hope you are keeping well. Have not forgotten the photographs of Duarrigle. Thanks for that Ceri. I can’t access my family tree database at the moment but from memory, Charlie wouldn’t be alive any more unless he was extremely old. I think we may be talking about a different person. I also think my Gran told me a lot of things that weren’t true! Oh well, the search continues. I presume you have your family in 1901 and 1911 census. If not you will find them here. Yes I have seen those pages before thank you. That’s likely where I got some of my information from. My aunt, Gwendolin Mary Ward was Thomas Justice (your uncle)’s first wife. They had a daughter, Rosemary. Hello, my name is Emmett, Ellen Justice was my great grandmother,the daughter of George Justice, I would appreciate any information you have on history of the family. i stumbled across a register of a will by a William Hearn originally from Cork, but who died on 28th June 1862 on the island of Fernando Pó (off the coast of Cameroon). The will totalled £25,000 and was split between his brother and his sister Maria Elizabeth Justice of Mount Justice (Duarrigle). £25,000 from 1862 worth almost 4 million euro these days. It’s a huge amount of money. I wonder if it fits into the Justices of Duarrigle Castle because the names are not mentioned elsewhere above. Calling the global O’Keeffe family to a major gathering. Calling all members and decendants of the global O’Keeffe family to a major gathering at our principal home at Dromagh in County Cork, Ireland on the weekend of the 10th of September 2016.
all culminating in a full buffet banquet on Saturday evening (for which booking is required). Where needed we will help in finding suitable accommodation and/or other services required by visitors. We are open to suggestions made in good time and will gratefully welcome any help and expertise in organising this major event. To contact us with your comments, suggestions and questions please click the ‘Contact Us’ button above. 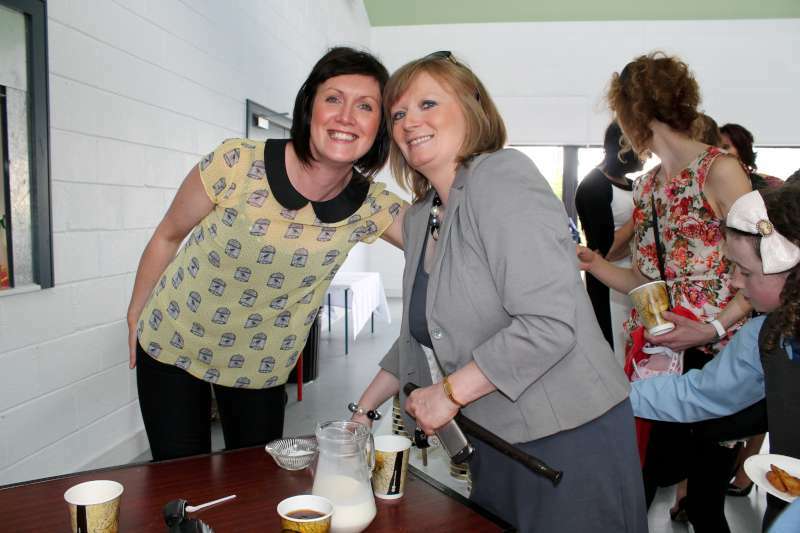 Dromtariffe Community Hall will be open to welcome and register visitors to the O’Keeffe Clan Gathering. The event will be formally opened at 8.00pm on Friday evening with a reception including light refreshments where visitors may meet and greet each other and meet members of the organising committee. Programme of all events, activities and exhibitions will be on display. Bookings where needed will be taken. Guided Bus Tours showing the geography of the Duhallow district with special emphasis on historical sites of interest to the O’Keeffe Clan. We intend having two different routes of two hour duration available, running from 11.00am to 1.00pm and from 3.00pm to 5.00pm with a stop for light lunch. People may join either or both tours. 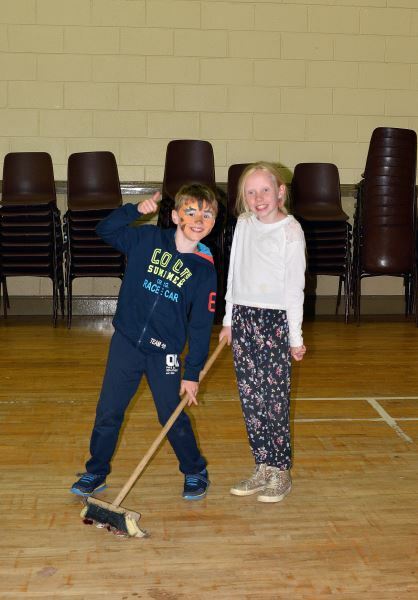 There will be a history exhibition in Dromtariffe Community Hall. We plan to have a genealogist in attendance who will be able to undertake research for visitors wishing to know more about their Irish connections. Buffet Banquet at 7.00pm followed by a Concert at 9.00pm. Following the banquet there will be a night of music, song, dance and story telling. The MC will of course facilitate audience members who wish to participate. 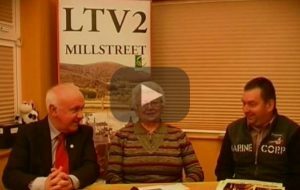 The Slieve Luachra distinct style of traditional Irish music will be much in evidence. 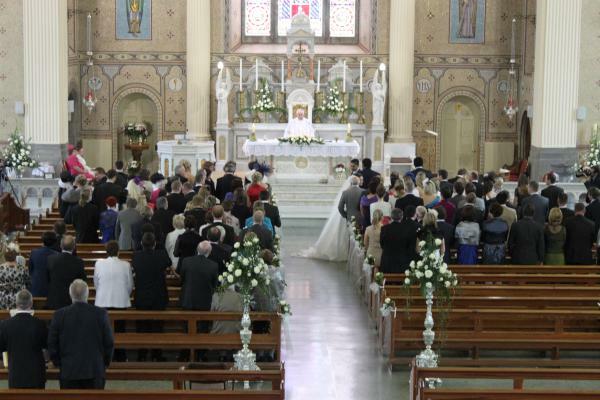 Mass will be celebrated in Dromtariffe Church at 12.00pm. Group visit and commemoration at Dromagh Castle. After lunch and following the group vitit to Dromagh Castle there will be a History Lecture in the hall, intended to provoke a lively group discussion to follow. I am the X3 great grandson of Grace Justice, who married the O’Shea. Her father was Henry Chinnery Justice and I believe he was the nephew of the first Baronet Chinnery MP for Bandon one of those in 1806 responsible for the dissolution of the Irish Parliament and act of Union. He claimed to be a direct descendant of the Chiefs of the O’Keefe in the Pedigree Published in Burke’s Peerage of the Irish Landed Gentry. The line ended with the Haldane Chinnery’s who died in the 1864 Abergele Train Disaster and I believe are the Haldane’s who occupied Gleneagles and are related to the Minister Haldanes Religious 18th C and Liberal Minister in Asquith’s early 20th Century Govt, in turn Walter Scott? 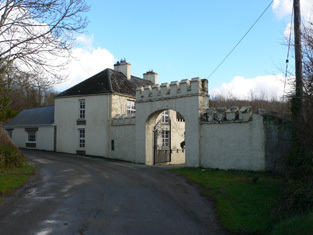 The Chinnery’s were one of the 4 post Cromwellian planter’s of Munster and lived at Flintfield on N side of Blackwater closer to Drishane…..which was owned by the Wallis family and HCJs sister married the 4th son…hence when he died I presume occupied Duarrigle purchased by her Barrister brother from Thomas Holmes Junior. His father THJ Snr had built the castle with proceeds culm mining and quicklime prodn, which was not too far from his profession as an Apothecary. 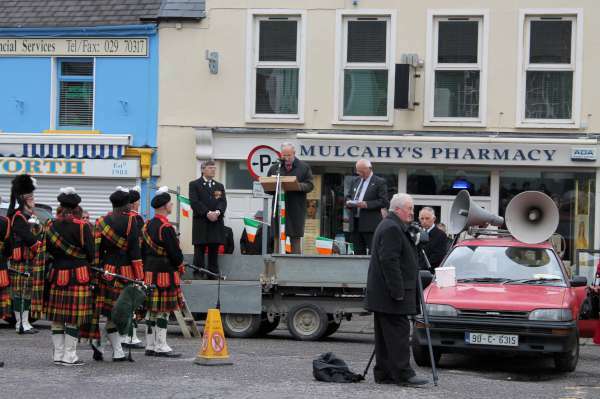 His son was a doctor trained in Edinburgh, the foremost European Medical school of the time, who practiced in Mallow. He was the Superintendant of the Mallow Spa in mid 19th Century (past heyday)and thus an early Rheumatologist. He could be considered to have been my professional forebear as well as I am a Consultant Rheumatologist in England. His grave is in St James’ COI in Mallow and he sold Duarrigle to HCJ the Barrister to house Grace and her wicked Aunt who married the Moriarty. Whilst some call it a mock castle it is a castellated house. I suspect it meant more to HCJ as it was the site of the last O’Keefe Castle from which they were finally evicted by the Ascendancy Rule……and he despite being a member of the Protestant Asc Culture no doubt claimed his descent from the Chief’s of the O’Keefe. 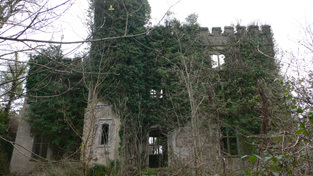 I believe my Great GF Timothy O’Shea owned the Castle till his death, 1953 in England when it was sold. He lived in Fermoy,I believe served in the Gallipoli campaign with his brothers and was the Quartermaster of the Fermoy Garrison on his return from Gallipoli? until 1921 when he came to England. His role in 1918-21 would be interesting – never talked much about Ireland according to my mother who visited Duarrigle with my GF/GM in 30s by Charabanc from Cork and remembers the Greek named occupier describing them as their Landlords. I believe my GGF owned houses in Millstreet? I suspect that one of his brothers ie O’Shea lived in Millstreet post WW1 and contrary to what local historians may have presumed were the O’Shea’s of Duarrigle. So enough but there is more. Geoff, Brian, Elaine you are relatives and Ceri, Ray, Maureen possibly. Mount Justice is different but they are same clan and only the very wealthy or nomadic married beyond their district in pre mid 19th Century. vant O’Sheas, Chinnerys and some Justices. I found your comments on family history most interesting, and like Brian Moriarty, would like to know more. That is really fascinating and now I am very keen to find out more about the “wicked Aunt who married the Moriarty”. My understanding was that the castle was left by Henry Chinnery Justice to his sister Ellen Justice when he died in 1859. She was married to Capt. Henry (Harry) Wallis who died in 1829. 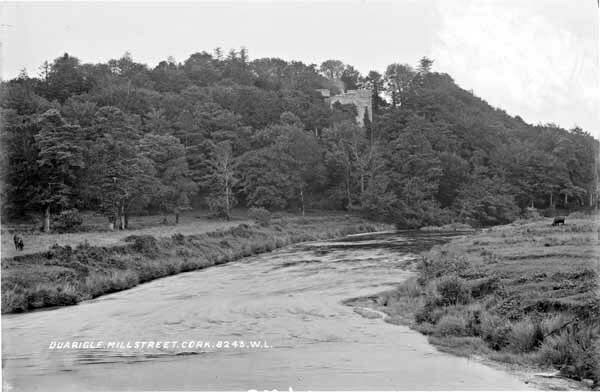 When Ellen Wallis died in 1865 she left the castle to her two surviving daughters – Ellen, who married Dr John Moriarty, and Mary Eliza, who married a solicitor named Thomas Hennessy Crofts. I’d love to hear more about the “wicked Aunt”. Essentially HCJ made his will on his deathbed I suspect with Sister in attendance…..which disinherited his Daughter Grace living with 4 children in Boherbue. The will would have included Duarrigle, Gurrane House, Pearse St property? and 4 Ely Place. The latter had Chief Justice of Common Pleas and President Coll of Surgeons adjacent (College had key role in St Stephen’s Gn area of Easter Rising). Dowager Lady Powerscourt down the street. The daughter’s in one who married your Moriarty relative had weddin announced as ….of Duarrigle Castle etc. I know later 1880s? less affluent though still owned Duarrigle and farmland around. The prestigous antecedence were recognised around turn of century when my GGFs sister eloped to avoid marriage to a Co Cork Judge. My GGF saw it as disgrace, he acquired Duarrigle around that time. Of course niame Moriarty not well known England except for Prof Moriarty in Sherlock Holmes I think Conan Doyle used name of fellow Med Student Edinburgh as he based SH on lecturer…history/physical signs were all important given no blood tests or X-rays. I wonder who your father Thomas John’s parents were, when he came to England and where and his sibs? So the wicked aunt – Ellen Wallis (nee Justice) was not married to the Moriarty! One of her daughter’s was (Ellen Teresa Wallis). She married Dr John Moriarty who was the son of Dr Mortimer Moriarty – who graduated from Edinburgh in about 1809 and practiced in Killarney. I did note that Ellen Moriarty and her sister’s husband (her sister Mary Eliza had previously died) sold a property in Westland Row (#37, 38 & 39), Dublin in 1875. This had probably been left to them by their mother. Ellen Moriarty died in Cork in 1914. She retained some property in the early 1900’s around the Duarigle area – possibly from her father’s family, the Wallis’s. Moriarty was a very common name in Kerry. All my commentary was from memory…I will have to find all the data at some point. The Westland Row property is I am sure the fourth of HCJs, it joins Pearse St,those 2 streets are essentially the back wall of Trinity College. Brilliant, it establishes that Ellen Wallis left her property jointly to her daughters which I am not sure whether it is unusual? Have you come across her will?I obviously don’t know how much more you have found out re what Dr John Moriarty and Ellen were doing presumably your branch..have you got all the links in the line to yourself? or indeed what Mary Eliza was doing? My understanding Censuses not available…for Cork 1861-1891 but Dr John could be in the Business Gazette’s etc or was he carrying on his father’s practice in Killarney? or in a Cork Hospital there would have been Mercy in centre and Southern Infirmary and St Finbarr’s may have only become Hospital later I think? I believe either Ellen or Mary Eliza probably lived with their cousin’s daughter ie Annie Lane nee O’Shea in her house in Grand Parade or South Mall st Cork in mid to late 19th century…? Ellen still owning some of the farmland around Duarrigle is what I would have expected…I will have to check when 4 Ely Place was sold as this would have been a prime property but rental income may have been more important to forebears? Yes Ellen Moriarty was living at the same address as Annie Lane in the 1901 and 1911 census. In 1901 Annie was listed as niece and in 1911 as Boarder. I haven’t known who she was or where she fitted in until your note above. If you contact me off-blog I will give you more info about the Wallis/Moriarty family. Hi, I am a Justice descendent living in England. I have a lot of information about the family history in Cork, Kerry, and in England. I am looking to speak with other descendents, especially Geoff (we used to converse over email in the early 2000s when I lived in America, but your old email stopped working). So anyone who would like please email me at <email> and get in touch. I wonder if anyone could place a Charles Justice for me please within the Justice Family. I was wondering were his branch were from, and who his parents were. Died on May 28th 1898 and is buried in Erie, Pa. Apparently he had two brothers, Henry and Nicholas, both of whom emigrated to New York.